Olympic National Park’s Hoh Rainforest backpacking trip offers the perfect sample of the diversity the Olympic Peninsula is known for. You will hike through Olympic’s temperate rainforest that sees 140 plus inches of rain annually to ice fields below the Blue Glacier, all the way hiking along the Hoh River and Glacier Creek – the best of what Olympic has to offer. This out and back hike will have you finding something new around every corner – whether it is vegetation, interesting formations in the trees or a herd of Roosevelt Elk sunning themselves by the Hoh River or a black bear eating berries along the river bank. The rainforest is the driest during the summer months, but expect to see rain – just not as much as the rest of the year. But even a little rain can’t ruin this trip as the canopy does provide some protection and without the rain, you couldn’t experience such an amazing place! Explore a rainforest without going south of the border! 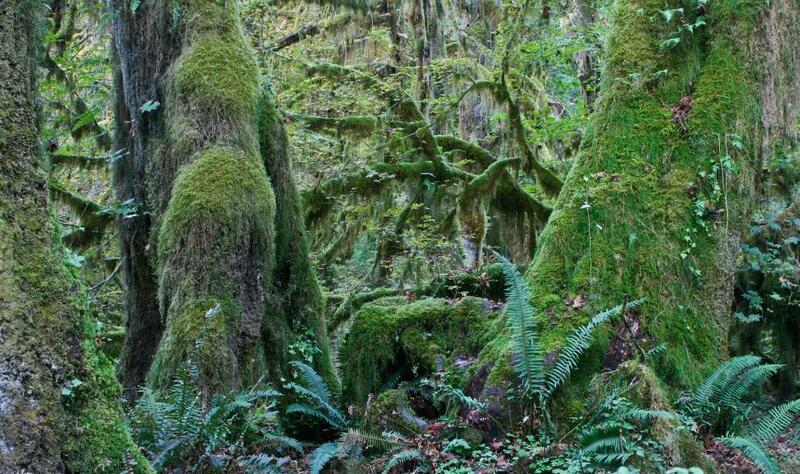 Hike the carved trails through the Hoh Rainforest’s lush vegetation along the Hoh River. But this isn’t the tropics! Summer only brings an average of 3.33 inches of rain per month in the area (just a bit more than what you will encounter in Grand Canyon over the summer). Find your way to the base of Blue Glacier and views of the glaciated peaks of Mount Olympus. Because you will be hiking through diverse Olympic ecosystems, you will encounter an array of flora and fauna like none other. And since there are no roads traveling through the park, you will not encounter rubber necking tourists driving by! It is just you and Mother Nature. There are many options for this trip. Take an abbreviated trip for 3 days and get just a taste of the Hoh rainforest, or add a 6th day to camp a night at Hoh Lake, take a rest day or have a day of less hiking. Let us know what experiences you are looking for! Get ready for a full day of adventure! You will start at the Hoh Rainforest Visitor Center. Although the visitor center can get a bit crowded, you will find yourself in solitude after a couple miles into the hike. Today’s goal is to hike 9.2 miles (14.9km) to the Olympus Guard Station and camp. The hike has a gradual overall ascent of approximately 500 ft, so a nice warm up hike to get you ready for the next couple days of over 4,000 ft elevation gain! After breakfast, the group will pack up and head to Elk Lake Camp, where we will be spending the next two nights. This 6 mile hike is where we see are first big ascent towards Glacier Meadow and Blue Glacier, crossing Lewis Meadow and eventually the Hoh River. Today we will ascend approximately 1,500 ft – the gain is well worth the views. Today we load up the day packs for a hike to Glacier Meadows and Blue Glacier Overlook. This 6 mile round trip hike may be light in miles but heavy in elevation. We will ascend approximately 2,600 ft over 3 miles to an elevation of 4,700 ft at the overlook. We have all day to explore, so take your time and take some pictures. We will have lunch on the trail while absorbing the beauty around us. We return to our base camp at Elk Lake Camp for the night. Today we start heading back the way we came, but all down hill! Even though we are hiking the same trails, you will be surprised how different everything will look. Besides, going downhill may give you a chance to look around instead trying to catch your breath! We head back to Olympus Guard Station and camp, a 6 mile hike. As the tour comes to a close, we hike back to the Hoh Rainforest Visitor Center. We have 9.2 mile hike today, along the Hoh River. But not to worry, just because you are hiking back along the same trail, you will see things you never noticed on your way into the forest – like maybe a herd of Roosevelt Elk that weren’t hanging out by the river the first day.